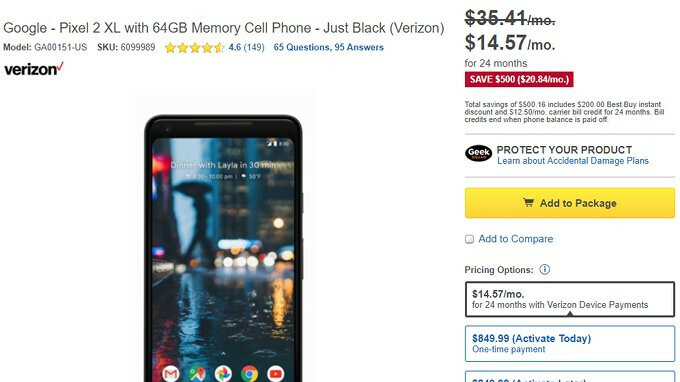 Best Buy has a crazy deal on Google's Pixel 2 XL, one that offers a huge discount on the flagship, but requires signing up with Verizon and paying the device over a 2-year period. Although the Pixel 2 XL still sells for $850 outright in the United States, Best Buy offers the smartphone for just $350. However, the massive $500 price drop comes in the form of $300 worth of bill credits from Verizon and $200 Best Buy instant discount. So, no, you can pay $350 upfront for the Pixel 2 XL and live happily ever after. Instead, you'll have to sign-up and pay the smartphone over a 24-month period. Basically, this means that you can buy the Pixel 2 XL for just $14.57 per month (was $35.41 per month) and no upfront payment. If that doesn't bother you, then you'll be pleased to know that Best Buy has both Pixel 2 XL variants on sale: 64GB and 128GB. The latter can be had for $18.74 per month (was $39.58 per month) for 24 months and no upfront payment, so you'll be getting the same $500 discount. Its $20 for line access if you dont have an unlimited plan otherwise youre paying that no matter what phone you get. All other carriers have line access fee to if your not using their unlimited plans. So, if I have unlimited I don't pay that line access? Thanks in advance.